The Old Bull Market is Stumbling. Are Stocks Too Risky? After years of fairly steady advances in the stock market, and repeated warnings that prices were getting too high, February brought a sudden 10% correction — reminding us that equities sometimes go down really fast. That icy plunge, followed by choppy markets since, have stirred worries that this might be the start of another major market washout, like the financial meltdown of 2007-2009 or the tech crash in 2000-2003. Emotionally those were frightening, painful periods for investors, as you may remember. It is unnerving, or irritating at the least, to own stocks and have them shrivel by 50%. However, as with all prior crashes, the financial damage was only temporary – unless one sold out in despair near the bottom and missed the recovery. Sooner or later – we don’t know when – stocks are going to suffer another serious downturn. Like bitter winter weather, but with unknown timing, bear markets come along every now and then. Nobody enjoys these cruel periods, but we just try to get through them, stay invested, and hope for better times ahead. If we are lucky, and brave enough, we may find a few bargains to buy. Investing is the art of accumulating assets, and if prices are low because the public is frozen in fear, it could be a great opportunity to do some shopping. It may not feel very good at the time, for we’ll be scared too. A market crash frightens us because it is dramatic and beyond our control. A lot of time and brain power are spent worrying about these corrections and trying to anticipate them. But there are other destructive forces in our lives that operate slowly, silently and almost unnoticed, yet may in time cause more damage than the big loud events. What inflation, termites and rust have in common is that they all work to devour our assets. For help with termite and rust prevention you will need to call someone else, but we’d like to say a few words about inflation. Its ravages should not be underestimated. Inflation – depreciation of the currency, by creating too much of it – is a hidden tax that makes our dollars worth a little less each year. It shows up as higher prices. From day to day we scarcely notice it, and even then people may be confused as to the cause, with labor and business blaming each other for a rising cost of living. That is why governments for centuries have favored this form of taxation. Over the past ten years, inflation, measured by an increase in the Consumer Price Index, has averaged 1.62% per year. That doesn’t sound so bad. It’s even below the government’s proposed target of 2% which they suggest is needed to keep the economy from stagnating. But an erosion of 1.62% per year means that after 10 years your 2008 dollar is only worth 85 cents in terms of what it will buy today. You may still have the dollar, but it has less power now because prices are higher. In fact, the past ten years have been a rather quiet period for inflation. Over the past 50 years, the annual increase in consumer prices has averaged a more serious 4.05% per year. At that rate, the value of a dollar would fall to 66 cents after ten years; and after fifty years, the buying power of a 1968 dollar has withered to 13 cents – a tragic loss of value for long-term holders of cash. Meanwhile, as cash was losing 7/8 of its value over 50 years, the dollar price of the stock market (S&P 500 Index) grew by 26 times. With dividends reinvested, stocks at the end of 2017 were worth 121 times what they were at the end of 1967. That works out to an average 10% per year, compounded over 50 years. Equities have more than compensated – by far – for the damage done by inflation. It is true that during that time there were some awful sinking spells, during which it felt like stocks must be the worst possible investment. But they recovered, and kept on going up as the companies grew. Thinking ahead to our retirement years, we want to protect the purchasing power of our savings, so stocks would seem an essential ingredient in anyone’s investment plan. Despite near-term ups and downs, nothing has provided greater risk control over the long haul than equities, which can be bought by anyone, even if they must start with small amounts. To provide a reliable, steadily growing stream of income, it is hard to beat the power of constantly rising dividends generated by America’s many great companies. The odds are stacked heavily in our favor. Most wealthy families own at least some stocks, and hold them for a long time. They are thus part owners of American business, which is a big reason why they stay wealthy and gradually grow more so. We would love to see this easy path to prosperity continuing indefinitely into the future. But it would be wrong to assume that 10% average equity returns over the last 50 years guarantees the same in the years ahead. It does not. Investment performance depends importantly on the starting point, and it helps if you start at a low level. The trouble is, we are nowhere near a low level today. The end of 2017 saw record high prices in the U.S. stock market, which likely means we need to tamp down our expectations going forward — maybe by a lot. 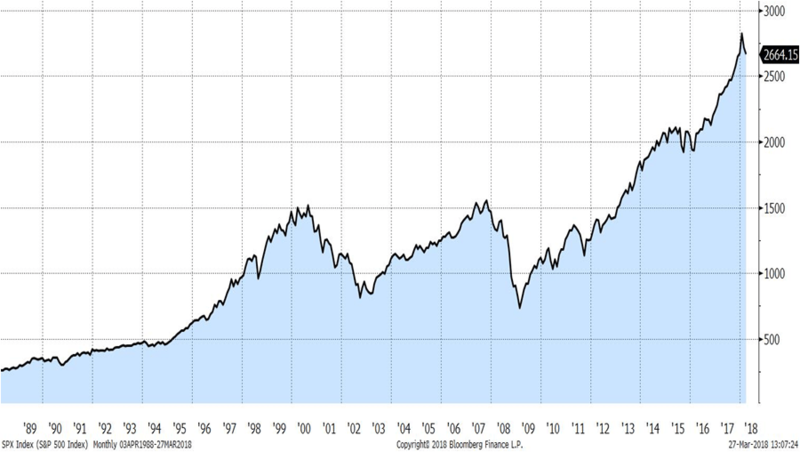 As an extreme example of what can happen to those who overpay, Japan’s Nikkei stock index reached a speculative high point in 1989, and today, 29 years later, it still is 44% below that peak. Our market is not the Nikkei, but you get the idea. Subdued returns may be a letdown for you and me, but they are already causing anguish for corporate and government pension funds. Many such retirement plans base their calculations on optimistic assumptions of future investment gains, around 8% per year, which at one time seemed realistic. But how can they earn that much in today’s environment? They aren’t making 8% from bonds, and they may not get it from stocks either. In decades past, to avoid labor troubles, generous pensions were granted to the employees. Their lawyers and unions now regard those as sacred obligations, but there are not going to be enough dollars to pay the benefits. Angry strikes erupt when any attempt is made to trim the payouts. With every year of weak returns, and persistent withdrawals, the underfunding grows worse. Where is that money going to come from? Fellow Taxpayers, they’re looking at us. No one knows the future. In one’s personal finances, we would advise a balanced approach. Treat your investing as a relaxed game, enjoy the ride, and try not to be in too much of a hurry. The stock market has proven a magnificent builder of wealth in the long run, but it will let us down if we push it too hard for quick profits. Easy does it. We just went through an extended period when cash was a sure loser due to inflation, and stocks did quite well. But there will be other times when stocks are collapsing and some cash is exactly what you would want to have. Charlie Munger (co-CEO with Warren Buffett at Berkshire Hathaway) once joked that the way to avoid being disappointed in marriage is to lower our expectations. That seems a needlessly gloomy outlook for romance, but it might be a useful attitude for investors. Be conservative – you’ll sleep better. Another anniversary. Hopefully the last for a while! Copyright © Monarch Capital Management, Inc.